Those of you who habitually grind your own grain bear with me while I write this post. This was my first time! I had a bag of Einkorn from Germany which has been sitting on the shelf waiting for this moment. I had read about this fabled grain and nagged my friend Mandy to bring me some next time she went over. She brings me rye and all sorts of lovely baking ingredients and I make bread for her. It’s a good trade! 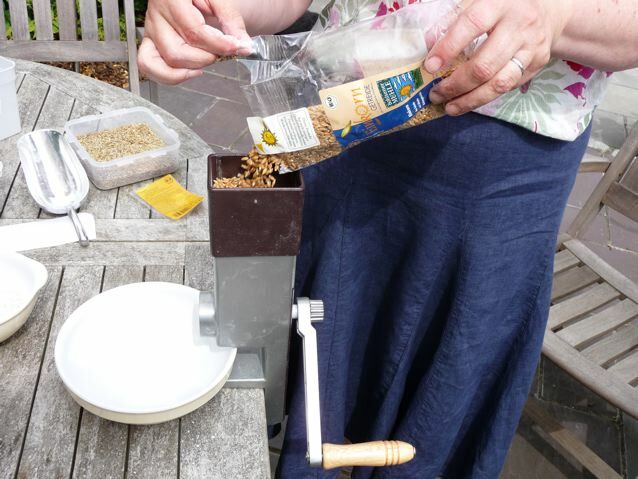 Brian found a much reduced handmill in the Lakeland sale the other week, so we thought we would try it out. It doesn’t make what I would call the finest grind of flour, but it was very exciting trying it out. 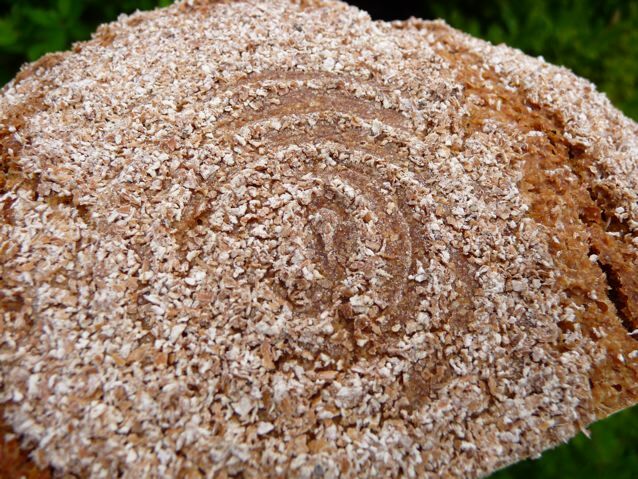 Einkorn is meant to be one of the oldest forms of wheat around. It produces a lovely golden flour with a sweet smell when newly ground. I fed my starter with some of the flour. Left it for 8 hours and then fed it some more. I ended up with about 150 grams of starter, it was very happy eating einkorn, no complaints there! 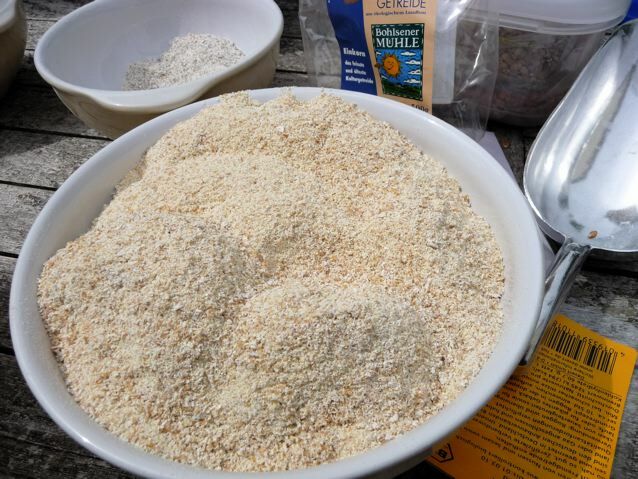 The following day I sieved the remains of the einkorn, I returned half of the bran to the flour and reserved the rest for lining the banneton with. 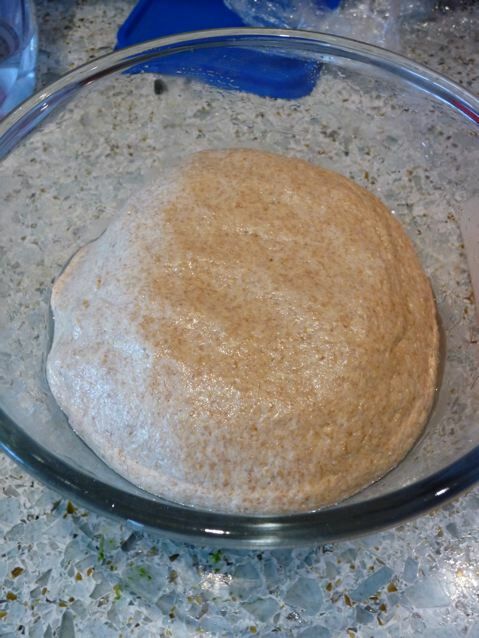 I mixed up this dough, with the 150 grams of starter, the rest of the flour (about 300 grams) 8 grams of salt and enough water to make a soft and sticky dough. Proved in a warm kitchen for 3 hours, then into a banneton, dressed with einkorn bran, for another 3 hours, it didn’t rise hugely, I wasn’t expecting miracles, as I had heard it has lower gluten levels than modern flour. There were lots of little gas holes in the top of the dough and so I thought I would bake it at that point. I baked it on a stone with steam, giving it all I had. It didn’t rise hugely, but it didn’t collapse either. 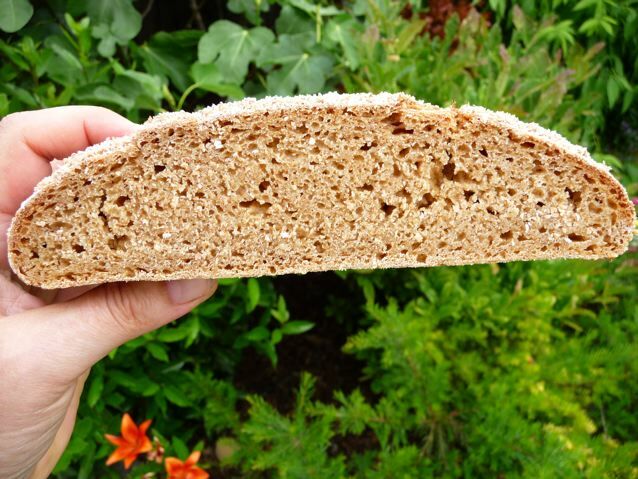 This entry was posted in Bread and tagged Bread, einkorn, hand mill, Lakeland grain mill, sourdough on 04/07/2010 by Joanna. 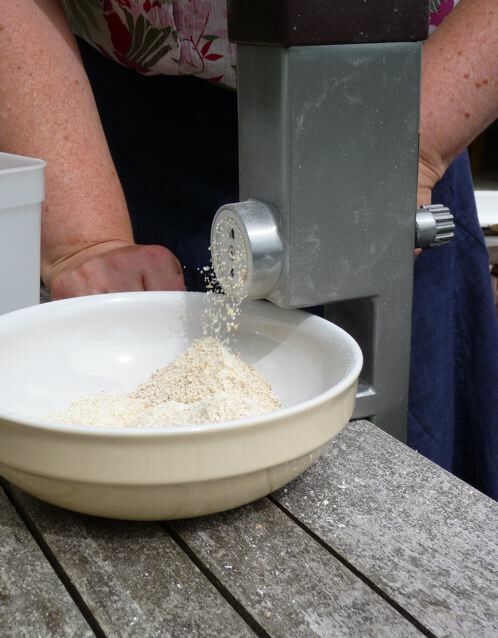 Not many people go so far as milling their own flour. If you are very allergic to wheat or nuts or something like that it is probably the only way to make sure that what you use is as free as it can be from contaminants…. I think you should be very impressed with yourself! It hadn’t really even occurred to me to grind my own grain! The crumb looks really good (to my untrained eye at any rate!) and it sounds delicious. Love this post, Joanna! What a great feeling! I’ve been contemplating/dreaming about grinding my own grain for a while . . . the mills just seem so expensive. I keep hoping to stumble on a good used one! “Old World grains” is interesting. It would be fascinating to see, hands on, what people were making breads with way back before genetic engineering and such advancements. Thanks Paul ! I am going to play with some rye grain next and see what I can get from that. Have you read Farine’s Meet the Baker blog post on Gerard Rubaud. That’s what made me think about grinding grain, that and having bags of grains I didn’t know quite what to do with apart from boil up for pumpernickel and the like. Hi C, mostly it was just fun. I kind of knew I should mix the flour with something else, but I just wanted to see what came of one flour all on its own. It was delicious and more digestible than very high gluten bread. Or so I tell myself. Abby, I would love a good electric used mill too! I kept looking at my three little bags of grain and thinking how can I possibly justify that cost for these? I know in Germany the wholefood shops have grain grinders and will grind grain for you. Why they can’t do that here I don’t know…. MIlano salami is pretty good too :) What I have read, and it is always reading with me, is that yes your miller friend is right, flour is better being allowed to oxidise for six weeks, but there is also a school of baking where you bake with freshly ground grain and get great results too, see the comment above referring to Gerard Rubaud, so either fresh or aged for the six weeks, not somewhere in the middle….but having said that, I don’t know enough about it in practice. This is like being a beginner all over again, which is great! Another breakthrough! That really is intriguing. I love your sense of adventure. I have several hand mills; it is a long story, I sort of inherited one, but I have tried neither. One more thing on my bucket list, but it will have to wait until a motor gets attached, as I do remember grinding as a kid and it was really hard work. That is a good looking slice! Thanks for the inspiration, J! I loved seeing your secondhand foodgrinderand the results! I bought one many years ago at a garage sale ( boot sale) for only $1 and have used it in bread baking demos and classes for children over the years. I especially like using it with children as they have the most energy and can mill many cups of flour before they quit! I liked your idea of sifting the flour to use the rougher portion for the crust in the banneton. Great post! Thanks.